Over the weekend Siberian high pressure brought cold weather to Finland with diamond dust halos along. The display shown here is the gem of the period. It was photographed by Jari Luomanen on 22. January 2006 at Sahalahti. It presents two components of reflected Lowitz arcs (arrows). As far as I know, there exists only three earlier observations with two components of these arcs, by Walt Tape and Jarmo Moilanen. Drawings based on photographs of two of the displays can be found here and here (in original slides the arcs are very faint). Reflected Lowitz arcs were considered already by Hastings in the early 20th century, but it was Swedish meteorologist Göstä Liljequist who gave in depth theoretical treatment in 1956. He named them as "Lateral tangential arcs to the 22° halo". There exists several observations - one by Liljequist himself and others by Tape - that show only the arc that match the curvature of the outer component (lower arrow in the pic). It has turned out difficult to simulate these displays, for one thing because simulations predict also the inner arc. It possibility that the displays with only the outer arcs are different phenomenon all together. 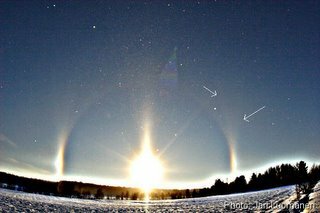 Luomanen photos, however, show genuine refelected Lowitz arcs and so far seem to be the best documentation of the phenomenon. Theoretically reflected Lowitz arcs also extend from parhelion all the way to subparhelion, which can explain observations of "parhelia legs". Nice display. Have Jari web site with some next photos? I just made a tiny page where you can find some additional photographs from the display. It's right here. Oops, the link above opens the page in the same window with the browser toolbars hidden (at least it does for me, I'm using Firefox 1.5 as a browser). You may want to right click the link instead, save the link target and then paste it on your browser's address bar for more comfortable viewing of my homepage. Thank you for link! Very nice photos...excellent! Patrik, thank you! Keep up the good work. Michael, congrats on your fine display! Do you have more images online?